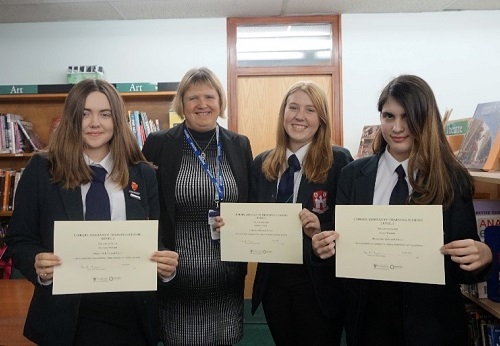 Congratulations to Year 11 pupils, Madison Holland, Charlotte Lewis and Cerys Wrench, on achieving their Student Librarian Awards. Shropshire’s School Library Service Manager, Donna Taylor, came into school to present the three students with their well-deserved certificates on Tuesday 9th April. The girls began the nationally-recognised training scheme at the end of Year 9, learning about the intricacies of libraries and what makes a good school library.